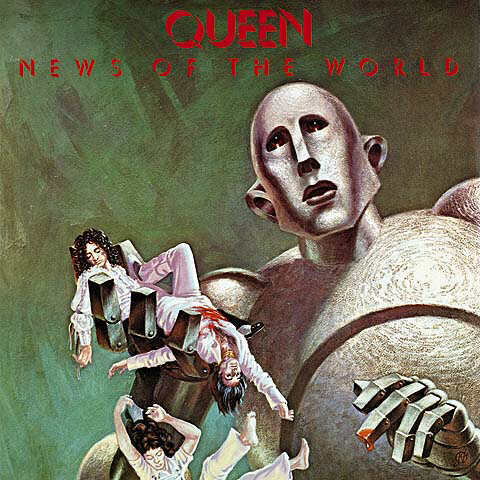 At the same time one of Queen's most under and over appreciated albums, this is one that's always a hot topic for discussion. While it's undeniable that this was the start of a tremendous downfall for the band (in terms of rock and prog, but a stupid uprising in terms of pop), there's still some fantastic moments on this disc none the less. Starting with two of the best rock anthems ever composed, the album gets off on the right foot. Often considered one song (and for some reason they also receive fire for being a gay anthem... I don't think that's what they were going for) We Will Rock You and We Are The Champions are excellent reasons why Queen still knows what they're doing. A killer solo from May in We Will Rock You, and some great deliver from Mercury in the second song make these two a very strong combination. Following up close behind is the rebellious and heavy Sheer Heart Attack. Not unlike the style of the album that it's named after, this song is frantic and rocking. A warning, though, don't turn it up too loud on a system that has a lot of high end... your head will explode. Some very strange computer-y effects near the end of the song are questionable, but good when they're not hurting your ears. Then the album really picks up. While the first songs were good... they just keep getting better and better. All Dead, All Dead is a melancholic song with some great melodies in the vocal department (as to be expected from Mercury). Dark in tone, this is one track that certainly stands out. Similar in tone, but even better in music is the sublime Spread Your Wings. This is definitely one of Queen's most overlooked tracks. Emotional and well played as any good Queen song is, this is one that is a huge standout on the album. From here on in the songs get a bit mixed. A couple of standard rock songs are on the way as Fight From The Inside starts up. This is the trademark Taylor voiced song, and he doesn't let down... but the song is nothing special on the album. Sleeping On The Sidewalk is more of the same, this one a bit more low-key and zoned out in sound. Who Needs You follows in the formula of the other recent songs and is soon over. While they may represent a weaker point of the album, each one of these tracks are definitely enjoyable... if nothing completely remarkable. But then we get what we've been waiting for... a Queen classic. It's Late is that song on this album. Soaring vocal parts and song excellent melodies form each member make this song the true standout on the album, above and beyond any other track. The album is worth it for this song alone, really. Afterwards there's really nothing left to do but let the album wind down with a slow track like My Melancholy Blues. Slow and peaceful, the album comes to an end. Like each Queen remaster this album also has a remix of one of the songs from the album. On this particular CD it's We Will Rock You which gets the treatment, but really... just stop the cd before this track starts... because it's not really worth your time. One of my personal favorites and one that's often looked down upon, this is a great album. Not really prog in any sense of the word, it will still entertain the socks off of most prog fans. 3 stars for a strong rock album.